Moist, soft and fruity, this cake is both gluten and dairy-free. It makes a moreish pudding or tea-time treat. Put 3 of the clementines in a pan of water, bring to the boil and simmer for about 2 hours until really tender, adding more water if necessary. Drain and leave to cool a little. Cut in half and pick out any pips, then whizz the fruit (skin and flesh) to a pulp in a food processor. Preheat the oven to 180°C/fan160°C/gas 4. Grease a 23cm springform cake tin, then line the base with baking paper. Put 225g of the caster sugar, the almonds, ground cardamom and baking powder in a large bowl. Stir, then make a well in the centre. Mix the pulped clementines, vanilla extract and eggs in the well, then mix into the dry ingredients. Pour the mixture into the tin. Transfer to the oven and bake for 50-60 minutes. Meanwhile, squeeze the juice from the remaining 2 clementines into a pan. Add the lemon juice and the remaining 50g caster sugar. Heat gently until the sugar is dissolved, then add the cinnamon stick and simmer for 3 minutes. Remove the cake from the oven and pierce the top in a few places with a skewer. Drizzle over the citrus syrup, then leave for 1 hour to soak in. Transfer the cake to a wire rack to cool completely. If you prefer, make a citrus icing instead of the sticky syrup. 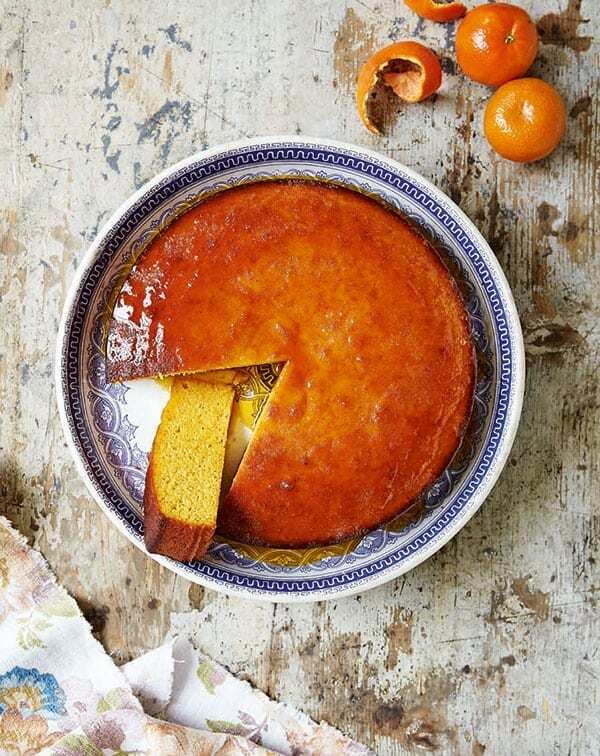 Mix icing sugar with enough clementine juice to make a runny icing, then drizzle it over the top of the cake. The syrup in this cake keeps it moist, so it stores well. Keep it out of the fridge, covered, for up to 3 days (if you haven’t eaten it all!). Boil and pulp the clementines up to 48 hours before making the cake. Keep in the fridge, covered. Freeze the whole cake, well wrapped in cling film, for up to 3 months. Defrost to serve. This cake is a real crowd pleaser! Make it the day before, it only gets better and better. Perfect for afternoon tea, breakfast and pudding with a drop of cream! Glad you enjoyed it, and thanks for the tip! Instead of cooking the fruit I blitz them raw. Leave it overnight in the fridge and it congeals into a thick jelly like state. Then I add it to the mixture as normal. This gives a richer more “citrusy” flavour and my guests prefer it. Then I tell the rest of the mixture and make the syrup. However, as the mixture hasn’t been cooked, there are small bits of peel in it so you have to strain it, and then pour the syrup over the cake. I also add a touch a Cointreau to it. The guests absolutely LOVE it. Better than the cooked clementine version first. They say it’s the best cake I have ever made. And I have made many that’s for sure. This was fantastic served with chocolate orange icecream! I love this recipe because it is just as DELICIOUS in the summer with seasonal fresh fruits as at Christmas with its delicious orangey hints of summer and perhaps even an added spice or two. Everyone loves it because of the almonds which make it so moist and no-one would tell (or even care) that it is gluten free! I love this recipe because…its actually great in the afternoon (or even for breakfast) with a huge scoop of greek yoghurt. Never woudl you know its gluten free or feel as though you’re missing out!